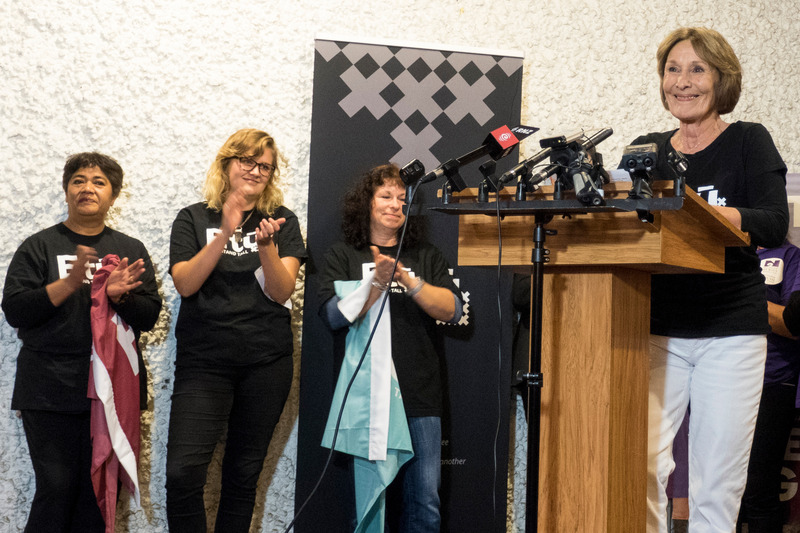 E tū has welcomed the Green Party’s commitment to pay equity for women. The party’s pay equity policy promises pay equity legislation which includes the recommendations of the Joint Working Group on Pay Equity principles. It would also require greater pay transparency by companies, so people know what men and women in the same workplace are paid. E tū Industry Coordinator, Jill Ovens says the pay equity policies of both Labour and the Greens recognise the integrity of the court rulings in the case of Kristine Bartlett vs Terranova, as well as the Joint Working Group principles. “We applaud the fact that this begins to recover the ground that’s been lost under a government which has fought against equal pay,” says Jill. “In the dying days of the current parliament, the Government introduced a bill that would slam the door on hundreds of thousands of women and their hopes of equal pay. Both Labour and the Greens have promised to put this right, which we absolutely support,” she says. Jill says the union also supports transparency on pay. 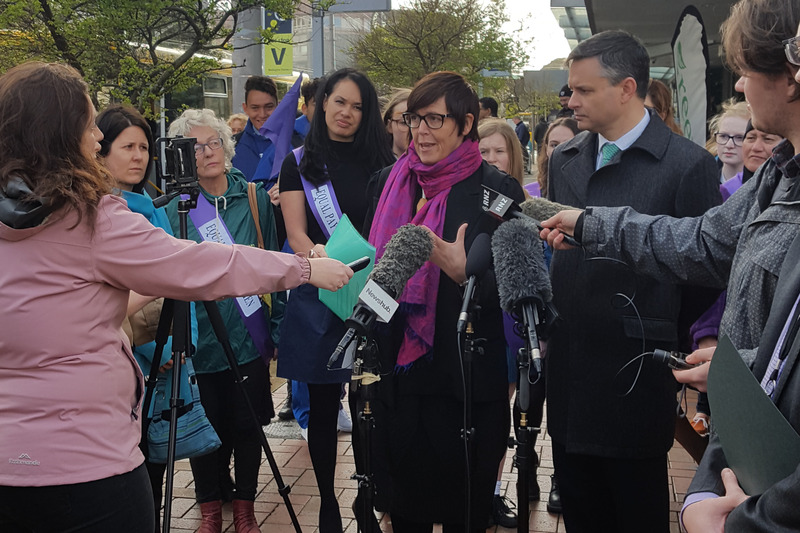 E tū Women’s Committee Convenor, Marianne Bishop says under the current bill, care and support workers would have struggled to achieve their historic pay equity settlement. “I think it’s great because obviously the new bill that National put forward, I don’t feel would have helped us get that settlement,” says Marianne. Marianne Bishop E tū Women’s Committee Convenor, ph. 021 257 4146. 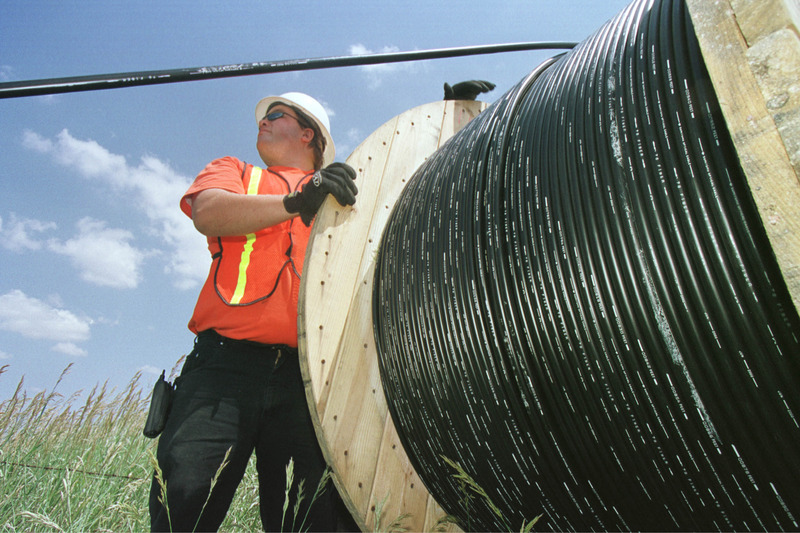 E tū says Chorus’s profit has been achieved at the expense of quality jobs and the integrity of ultrafast broadband (UFB) connections to homes and businesses. The Chorus result coincides with cable company Broadspectrum announcing today it will exit its connection contracts in Hamilton, Christchurch, Nelson, Blenheim, Rotorua, Taupo, and Whakatane. The move will affect 119 jobs, including 35 designers and about 50 technicians, with a net loss of about 65 jobs at this stage. E tū Industry Coordinator Joe Gallagher says the connection contracts will be picked up by Australian company, Universal Communications Group (UCG), which uses an owner-operator model favoured by Chorus because it cuts costs and enhances their profits. He expects most of the designers will find new jobs with Broadspectrum which will in future focus on laying UFB cables, as well as maintenance of the legacy copper network. But he says it’s a different story for the technicians. “UCG’s owner-operator model will effectively require the technicians to “buy” their new jobs. “They’ll have to purchase their own vehicle and equipment, at great cost,” says Joe. 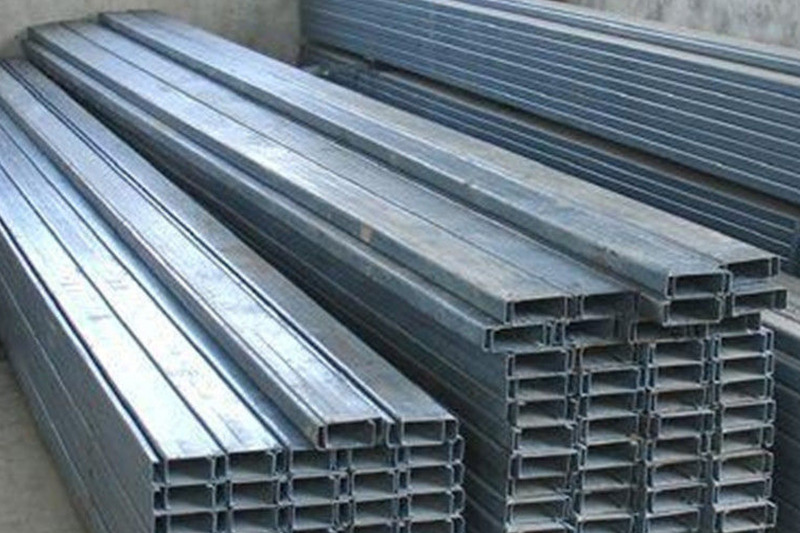 “In many cases, people will have to borrow the money for the equipment, but there is no guarantee of sufficient work to pay the bills and ensure a decent living,” he says. Joe says it’s likely much of the work will be picked up instead by unskilled migrants, with a resulting decline in the quality of home and business high-speed internet connections. “That’s abundantly clear by the situation in Auckland where complaints about installations number in the hundreds,” says Joe. Joe says the sub-contracting of the work is a direct result of Chorus refusing to properly fund companies like Broadspectrum to build and connect the UFB network. “Chorus can wash its hands of any responsibility for this work by keeping contracts at arms-length, leaving companies like UCG to hammer down costs on their behalf. E tū will be in the Employment Court in Auckland on Monday to argue its case on behalf of labour hire workers at global airline catering company, LSG SkyChefs. 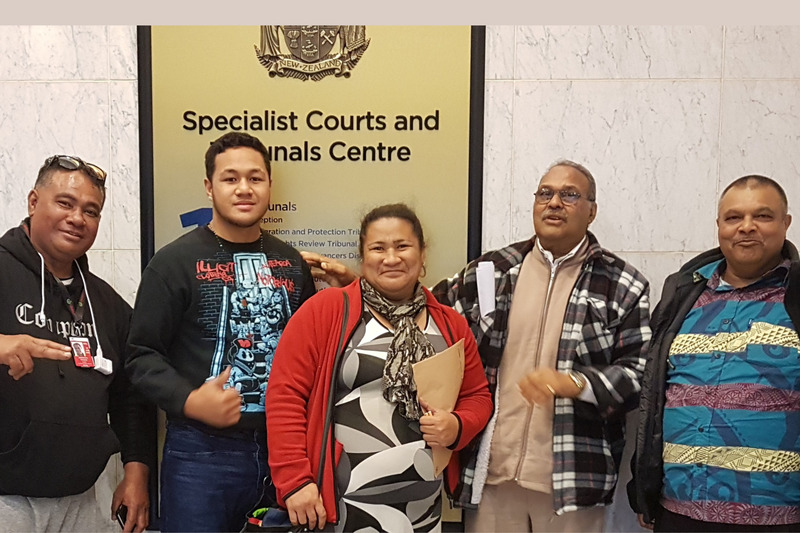 The union is acting on behalf of workers Kamlesh Prasad and Liutofaga Tulai, and will argue that they and other labour hire workers should be entitled to the same employment conditions as directly-employed staff. The company, which is owned by Lufthansa, operates kitchens in Auckland, Wellington, Christchurch, and Queenstown. E tū Assistant National Secretary, John Ryall says the use of labour hire has been growing in New Zealand as employers seek to cut their costs. But he says labour hire work is precarious. “Using labour hire staff means employers have no responsibilities to these workers and can get rid of them at any time without going through the normal consultation processes,” says John. “Labour hire can also be used to suppress wage demands because directly-employed workers fear being replaced by labour hire workers themselves,” he says. John says many labour hire workers are migrants, who accept minimum wage, casualised jobs with labour hire companies because they have few other options. Proceedings begin at 9.30am, Monday, 14 August in the Auckland Employment Court. 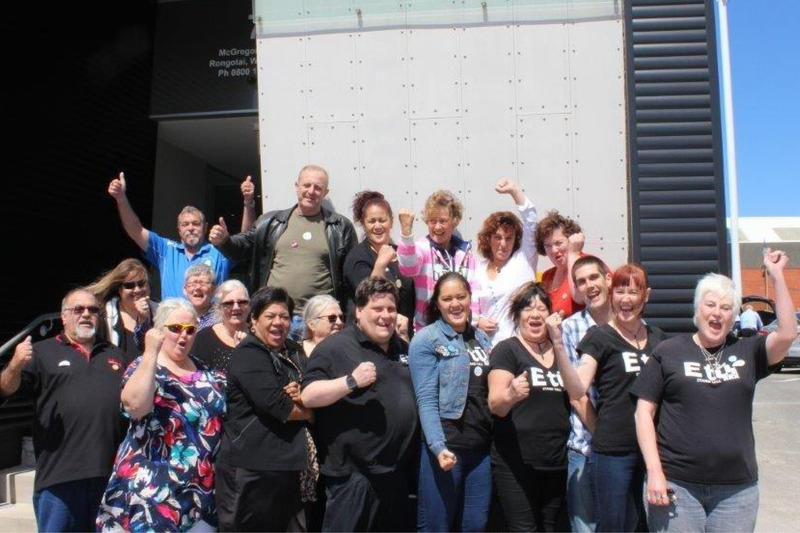 E tū is urging women to embrace Equal Pay Week, as it focusses on winning an Equal Pay deal for mental health support workers. These workers were left out of the Equal Pay Settlement after the government refused to include them. Mental Health support worker, Sandra Rawenata is one of those workers. “It’s unfair. We do pretty much the same work but we’re not paid the same,” says Sandra. “We’re very supportive of what’s happened for our colleagues in other care and support jobs. Sandra will be among the speakers at the event in Auckland tomorrow to launch Equal Pay week, 12 August – 20 August. “We’ve had a great win for care and support workers. But the government wants to change the law to ensure no one else wins Equal Pay,” says Yvette Taylor, E tū’s Equal Pay Coordinator. “If this bill passes, it means back to the beginning for mental health workers and huge hurdles for other women battling for Equal Pay,” she says. She says E tū will be participating in the events of Equal Pay week to drive home the message that women want Equal Pay and won’t settle for less. Wellington City Council parking officers will take strike action today to protest at the refusal by the Council to negotiate with their union over their wage rates. The parking officers have been trying for over two years to get their collective agreement settled but the Council refuses to include wage rates in the agreement. The parking wardens will strike from 3.30pm to 5pm this afternoon, with a picket in Courtenay Place. E tū has also lodged a case with the Employment Relations Authority, seeking a ruling on the impasse with the Council. 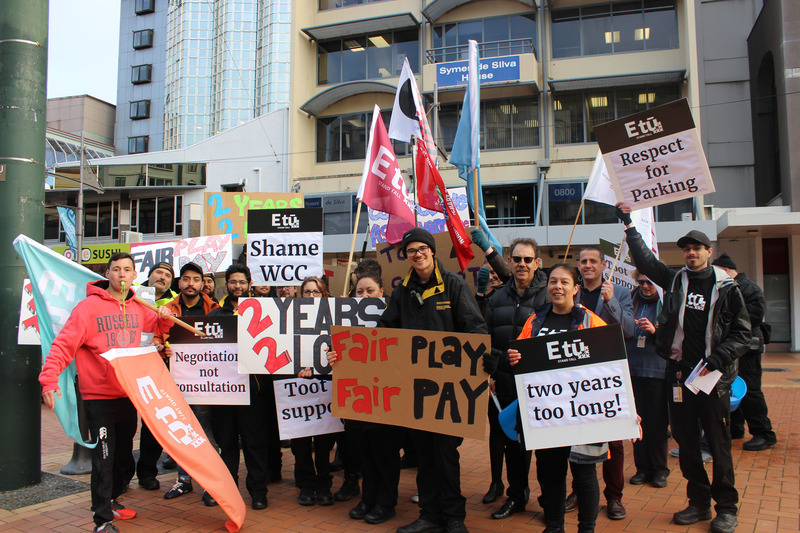 “We believe that the ongoing refusal of the Council to negotiate wage rate or include them in our collective agreement is a serious breach of good faith,” says John Ryall, E tū Assistant Secretary and advocate for the parking officers. “We have been to mediation three times, held high level meetings with the Council and now we feel that the only option is to go on strike,” he says. The parking officers are promising a noisy show to drive home their frustration. “We’re at the stage where we need to send the Council a message,” says E tū delegate, Steven Carlyon. “This is about our ability and our right to bargain for our wages as well as being able to negotiate how we move up the wage scale and into other roles, maybe even management. The parking officers will be picketing in Courtenay Place, from 3pm to 5.30pm, Friday 4 August. We have delegates who can speak to interested media. From midnight, tonight (1 July) the celebrations will begin in earnest as the reality of their big pay rise sinks in for 55,000 care and support workers in aged care, disability services and home support. These are workers included in the historic Equal Pay Settlement which has resulted in one of the biggest increases in pay for any group of workers in New Zealand history. Kristine Bartlett, who took the Equal Pay case which resulted in this Settlement, says many of her co-workers are overjoyed while for others the reality has yet to sink in. “There will be so many happy people. When they finally get the first two weeks of their new pay, they’ll see the difference it makes and can actually do a little bit of celebrating,” says Kristine. “They’ll be looking at their pay slips and trying to believe that after all these years they’ve finally been rewarded for the hard work they do, and they deserve this so, so much. I’m so happy for them and I’m so happy the union stepped up and made this happen. “For me, it really hasn’t sunk in and I’ll believe it when I see it in my bank account. Then I can say it has happened, because I’m still in a dream and I’ve been in a dream for quite some time,” she says. “We’re very pleased that this fantastic deal worth $2.06 billion is going to deliver this pay increase for these 55,000 workers,” says E tū Assistant National Secretary, John Ryall. Meanwhile, John says work continues to win the same deal for community disability support workers, funded by the Ministry of Social Development, and “we are fast reaching a settlement on that”, says John. Mental health support workers aren’t covered either with a pay equity claim lodged on their behalf with the Employment Relations Authority earlier this month. “These were two groups which were left out initially but they need to be included,” says John.